The Garden Rook Survey ran between July and December 2014. 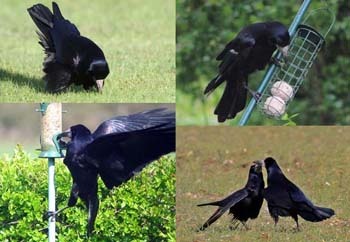 We aimed to find out more about the behaviour of Rooks in gardens. It covered six categories of behaviour: Feeding, Caching, Tolerance, Object Play, Social and Vocalization. Simple behavioural research in labs has shown that Rooks are highly intelligent birds, able to use tools and solve complex problems. With help from Dr. Nathan Emery, an expert in corvid behaviour, we wanted to look into how they use these skills in the wild, especially given their increased use of supplementary food. To help you tell apart a Rook from a Crow take a look at our Rook identification page.